Scenario 1: You’re presenting your product to the executives of a tech company, wearing your best suit and most convincing smile. You’ve spent weeks learning more about this company’s pain points and crafting an argument about how your product can solve those pain points. You’ve got your slides ready, and if you successfully close the sale, it means thousands of dollars in revenue for your company. Scenario 2: You’ve moved across the country for the summer, in between your sophomore and junior year of college, and now you’re standing at the door of a suburban home. You have documentation about the importance of home security in hand, ready to hand over as soon as you knock on the door. A win for you means a $200 sale and not having to eat ramen all next year. These two salespeople have more in common than you might think. Whatever methods your company relies on, every organization uses the same basic stages of the sales cycle to close deals. A sales cycle is a series of events or phases that occur during the selling of a product or service. This article will cover the typical seven steps or stages in that process, but remember that not every sale or customer interaction will follow the same path. 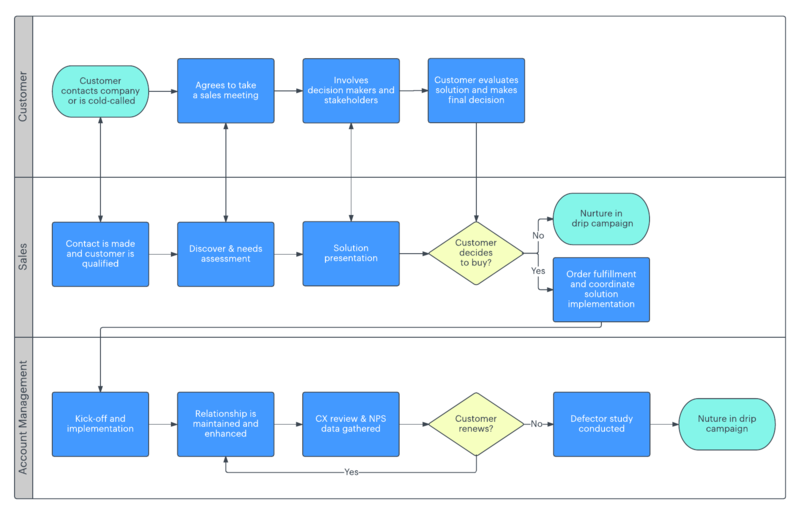 You can use Lucidchart to customize your sales cycle stages according to the services or products you offer (we’ll show you how to do that, too). To sell something, you must first have a customer or prospective customer. Identifying potential prospects is the first stage in any sales cycle and requires a solid understanding of the service or product you intend to sell. What does your product do that no one else’s product does? What problem or issue does your product overcome or solve? As you think about how your service or product will improve the lives or businesses of your clients, you will identify who your potential customers are. Prospecting for customers can also take the form of lead generation. Perhaps your website has a place for interested parties to enter their email addresses to learn more. Once you’ve received their information, that’s a green light for you to reach out and connect. Simplify your prospecting process and use a custom Lucidchart diagram to organize your leads. After you have identified your prospects, the next stage is to initiate contact. The communication channel you choose will depend on the business or type of prospect. In some instances, a phone call is the appropriate means of contacting a prospect, while other times your first point of contact may be an email or a more traditional sales letter. You aren’t giving your full sales pitch during this stage, just establishing contact with potential clients in the hopes of setting up a more formal meeting. 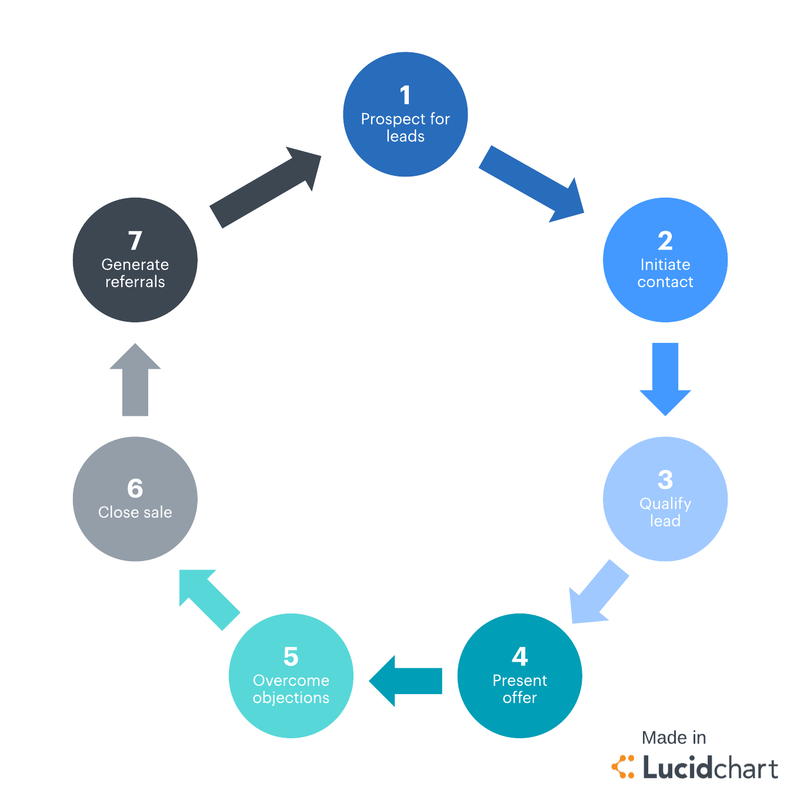 A sales cycle flowchart can help you keep track of the email or phone cadence to use if prospects do not answer the first time around. During this stage of the sales cycle, you will vet the client as much as possible. This process may be initiated in the contact stage of the sales cycle, but the majority of qualifying usually happens during the first sales meeting or appointment. This stage will save you time and resources, since you should only be pitching to qualified leads. You’ll want to find out if your contact person is a decision maker and, if so, whether they are actually interested in purchasing your product or service. If your prospect is not in a position to make decisions or purchase, politely ask to include a manager or superior in the meeting. Let’s recap: you’ve identified a potential new customer, initiated contact, and qualified the lead. Now it’s time to present what you have to offer. This is the most crucial stage in the sales cycle and requires the most preparation. You should aim to present your goods or services in a way that solves an issue the customer is facing. Be ready to demonstrate how using your product will improve day-to-day operations for your customer and how your company achieves this better than anyone else. Keep in mind that you’re also selling yourself during this presentation, so things like body language, mannerisms, and even your appearance can influence a sale. Your job at this point in the sales cycle is to manage and overcome any objections. Even the most enthusiastic prospects will have hesitations or objections—the price is too high, the contract is too narrow, the terms aren’t right. Don’t be afraid to ask for context to their objections. Does their hesitancy stem from an issue or interaction in the past? Are they still carrying some reservations from a past business deal gone bad? Listen patiently to what the client has to say and let them know you understand their concerns. Then reframe your pitch to acknowledge and overcome those concerns. If the price is causing concern, consider reframing the information in a per-day breakdown. For example, if your software service is approximately $200 a month, you can reposition the price as “just over $6 per day.” That’s less than a fancy nonfat extra-shot vanilla latte typically costs. The moment of truth has arrived. It’s time to close the sale, which is much easier said than done. There are a few different approaches to closing a sale, and they all depend on how the preceding stages played out. A less enthusiastic or tentative prospect will need a softer, more nuanced approach. Remember, you’ve laid the foundation through the previous stages in the sales cycle as to why this business or customer needs your product, so circle back to your main points and remind the prospect of why they agreed to meet with you in the first place. It’s important to remember that just because a sale isn’t closed during the first meeting, that doesn’t mean the sale is over. Some products, like large machines or complicated software, can take weeks or months to sell. The sales cycle is still in motion until either a sale is made or a prospect declines to proceed any further. The time to ask for referrals is right after closing a sale. Your new customer is (hopefully) excited about their purchase and in a position to recommend other clients. Save some time and energy, and ask your client if they have any friends or colleagues that might also benefit from the product or service you sell. You can also ask for referrals later on as your business relationship grows. It’s important to remember that each sales process is unique, and no two sales cycles are the same. The sales cycle stages can be as short as a few minutes or last as long as a couple months, but in general, every sales cycle follows a form of the seven stages above. Learning and practicing the sales cycle and refining your technique will help you increase sales and grow your business. Stay organized and on top of your contacts with a custom diagram from Lucidchart. Register for free today!